Severe pain, metal poisoning, lost mobility and noticeable shortening of limbs are among the adverse effects behind a potential hip replacement recall. The LFIT CoCr V40 Head, made by Stryker Orthopaedics, is a hip implant component that replaces a patient’s femoral head that connects with the hip joint socket. The LFIT — or Low Friction Ion Treatment — Anatomic head appears to be defective and may soon be subject to recall. If you’ve experienced a personal injury in Louisville due to a defective Styker hip replacement, contact our experienced team today to schedule a free initial consultation and case evaluation. You deserve to be compensated for your pain. The LFIT CoCr V40 Heads work by fitting into the femur, or thigh bone, of a hip replacement patient. 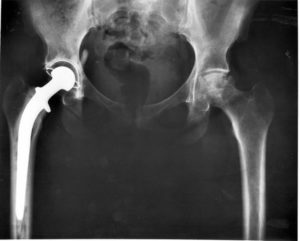 During a hip replacement, the taper lock portion of the device is inserted into the patient’s thigh bone. Multiple reports have surfaced of the part fracturing and corroding, which can cause a variety of injuries for patients. Among the potential problems are broken bones around the surgical site that can cause significant hip replacement pain symptoms and require corrective surgery. The device also appears to carry the risk of metal poisoning. An Australian agency similar to the United States’ Food and Drug Administration brought attention to the issues with the device. The manufacturer, Stryker, voluntarily warned the public, and Health Canada recently initiated a recall. The agency noted that it has received complaints at a higher rate than expected for certain sizes and varieties of the devices manufactured before 2011. The FDA’s Manufacturer and User Facility Device Experience database lists at least 100 reports of negative incidents associated with the device. Some of the events include significant pain or noticeable shortening of limbs. Following the warning from the Australian government and the recall by Health Canada, it appears likely that a U.S. recall will occur soon. Reports indicate that Stryker sent paperwork to a doctor that included a multi-page list of defective lots of the device, but the information has not yet been made public. Stryker implant devices have been the subject of previous problem reports and recalls. In 2008, the company recalled 5,600 devices due to an elevated risk of fractures to the stem neck when the device was used with certain other devices in patients who were classified as being overweight or obese. In 2011, the Accolade TMZF Plus Hip Stem was recalled due to a problem caused by employee error. In 2014, Biomet paid a $56 million dollar settlement when over 500 individuals had to undergo revision surgery after receiving a hip replacement. Two varieties of the company’s artificial hip products — the ABGII and Rejuvenate Modular-Neck Stems — were recalled in 2012 with a warning that the implants might cause damage to tissue surrounding the hip. As a result, patients might experience additional health problems, and patients who had the implants were urged to check with their surgeons. The products recalled in 2012 were found to cause metallosis, or metal poisoning affecting the tissues and bloodstream. Although the Rejuvenate system was not constructed with metal against metal, the recalled components were made from metal that apparently contributed to their high rate of failure and introduced metal particles into patients’ bodies. Following that recall, Howmedica — parent company of Stryker — agreed to a settlement of more than $1 billion with approximately 3,000 people who suffered effects from the defective systems and filed hip replacement lawsuits. Fast-Track Clearance: Bad for Patients? Stryker’s Rejuvenate system gained approval through the FDA’s fast-track, 501(k) process for approving medical devices. Critics charge that the fast-track system often doesn’t prove that medical devices are effective and safe for the public since it does not require clinical data. Instead, manufacturers must show that their devices are similar to other devices that already are on the market. Artificial hips historically have lasted for about 15 years under normal usage conditions. However, as the baby boomer generation has begun aging into the hip-replacement market, manufacturers have tried to create updated artificial hip products that will last longer and hold up better to an active lifestyle. The FDA’s fast-track system helps get these products to market in less time but without the practical testing that would be required in clinical trials. For patients, products that are rushed through the government approval process can lead to significant problems. Initial hip surgery can require a lengthy recovery; having to go through surgery twice within just a few months or years creates a real burden — along with pain and incapacitation. If you’ve undergone a hip replacement, it’s important to know whether the LFIT CoCr V40 Head from Stryker Orthopaedics — or another possibly defective product — was used. To determine the specific model of medical device used in your surgery, you can contact your surgeon. If you believe you have one of the possibly defective implants or if you’ve been harmed by surgery or medical malpractice, get legal representation from an experienced dangerous products attorney. For a free case review, please contact Meinhart, Smith, & Manning, PLLC.